Rob Castell, of the Rob Castell Boogie Band fame, brings an evening of solo songs and joyous fun to Crazy Coqs. Now a year into fatherhood, the musical theatre writer / internet rap sensation / comedy song musical polymath has decided this time to deliver an evening that's intimate yet desperately exciting. Expect original songs, topical musings, creative covers of classics, charismatic hosting and maybe even a guest. There will almost certainly be dancing... You'll just have to imagine the drums. Rob is an actor, songwriter and musical director known chiefly for his work as a writer, composer, musical director and performer with Barbershopera, the multiaward-winning a cappella comedy group (Soho Theatre, Trafalgar Studios, Plymouth Drum, Brno Festival, DIMF, Plymouth Drum, UK Tour, BBC Radio 4). 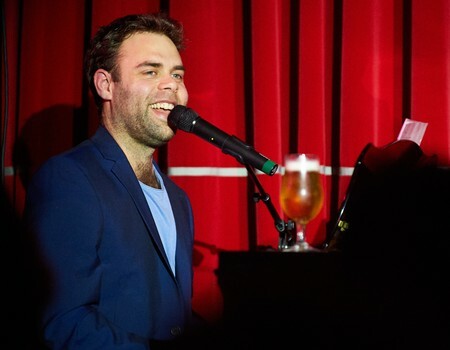 He also writes and performs the songs for BAFTA-nominated CBBC show Officially Amazing and has co-written a new full-scale musical set in Ancient Greece. He wrote the music and lyrics for a new rap version of Robin Hood which has just been produced at Theatre Peckham.